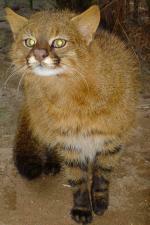 Bay Cats are one of the rarest and least studied species of cat in the world. They have a body length of 55 cms (22 inches), a tail length of 35 cms (14 inches) and they weigh between 2.3 and 4.5 kgs (5 - 10 lbs). They are reddish brown or grey in colour with a pale coloured underside. They have faint, dark markings on their underside and white markings on their head and chin. Their tail is long and they have small rounded ears. 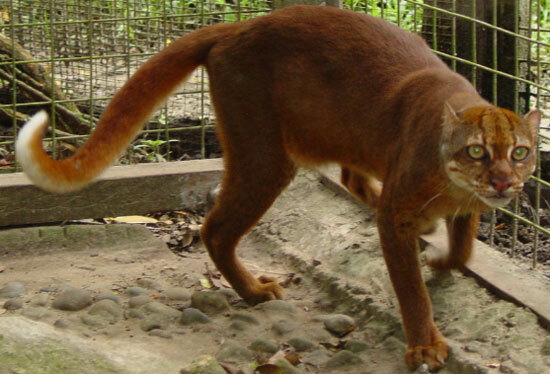 Bay Cats are found in the dense forests of Borneo and it is likely they live close to a water source. It is thought that Bay Cats feed on small mammals and birds. Little is known about reproduction in Bay Cats. There is no recorded data on predators of Bay Cats. There are no subspecies of the Bay Cat.